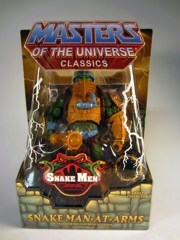 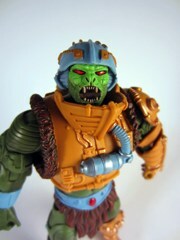 The character Snake Man-At-Arms comes from a 2003 episode of the Masters of the Universe cartoon in which Duncan gets turned into a snake man, temporarily. 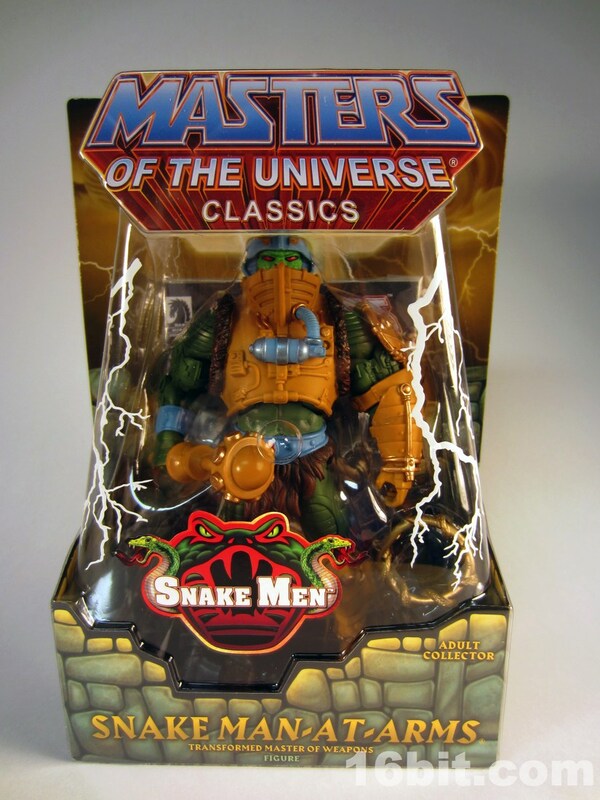 The idea was to bring him back that way permanently as the Snake Men vehicle designer, and to some extent this was explored in a comic book which came packaged with the DVDs of the show. 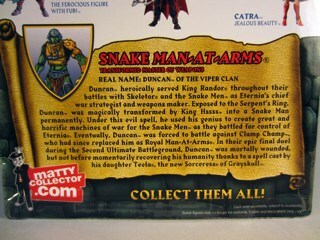 The Classics fiction takes it a step further by not only transforming him, but letting you know he dies. So along with the Sorceress, they slowly seem to be killing off a few of the heavy-hitters from the original series but at least we got a decent action figure out of it. 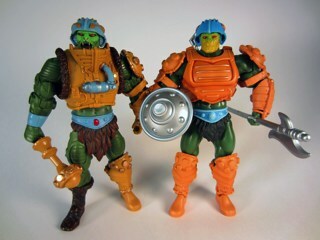 Snake Man-At-Arms probably has a more interesting backstory than most figures, because in this case fans actually got Mattel to redesign him after being unveiled to the public. 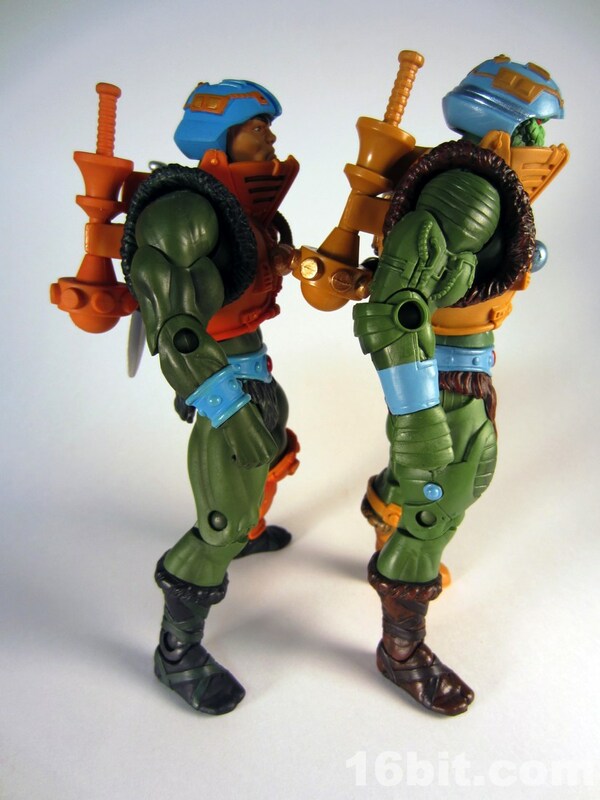 If you go look at the NYCC coverage you'll see the same basic head, but the figure's body is different than the one in this review. 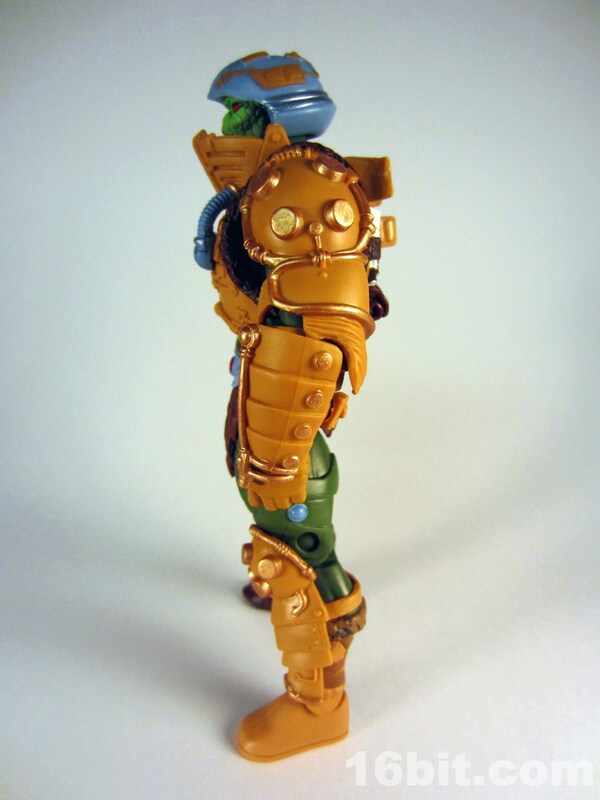 He's made primarily of standard Man-At-Arms (2009) parts, but in the 2002-esque coloring. 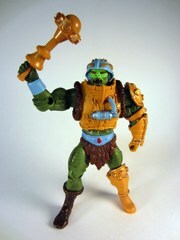 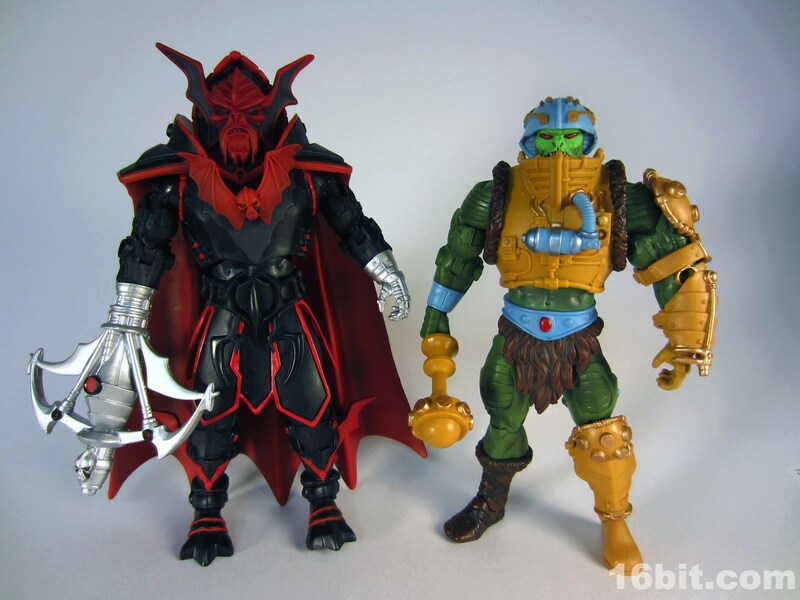 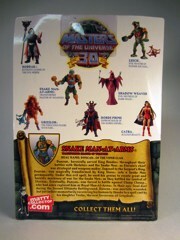 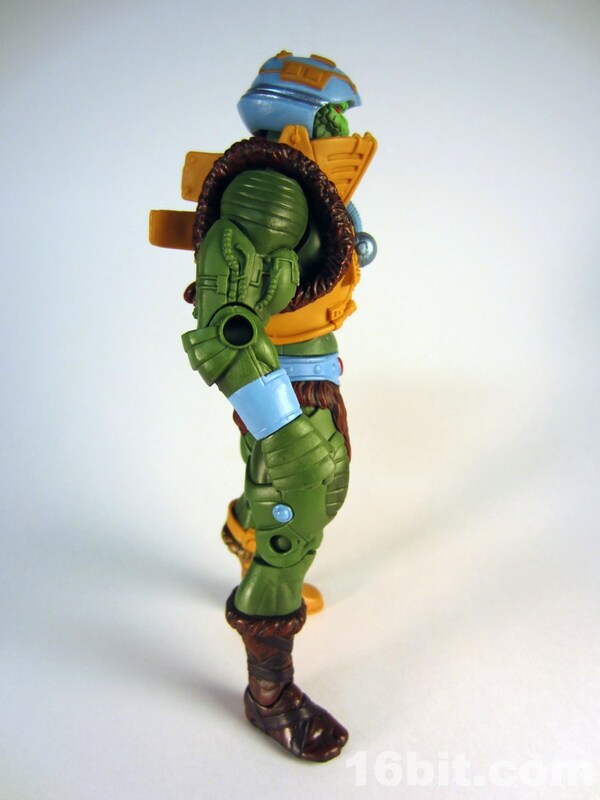 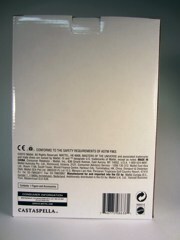 Mattel changed the figure to incorporate things like Roboto's arms and Trap Jaw's legs, plus mismatched feet which more accurately portray the 2002 version of Duncan's action figure. 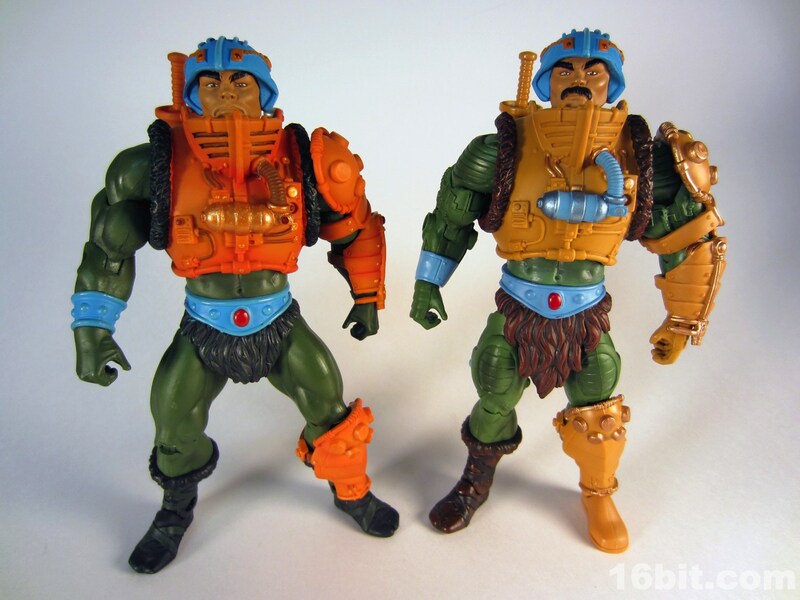 The new paint job is nothing to sneeze at, either. Accessories are somewhat lacking, as evidence by the empty weapon storage rack on his back. 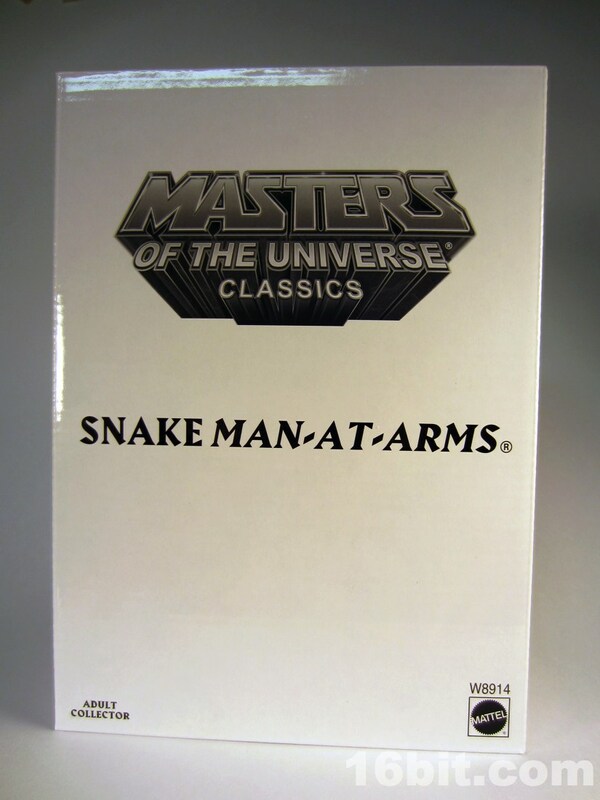 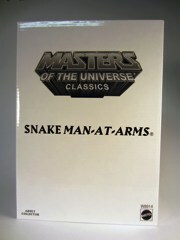 It can carry Snake Man-At-Arms' club, but no other swords or guns were included so it just looks empty most of the time. 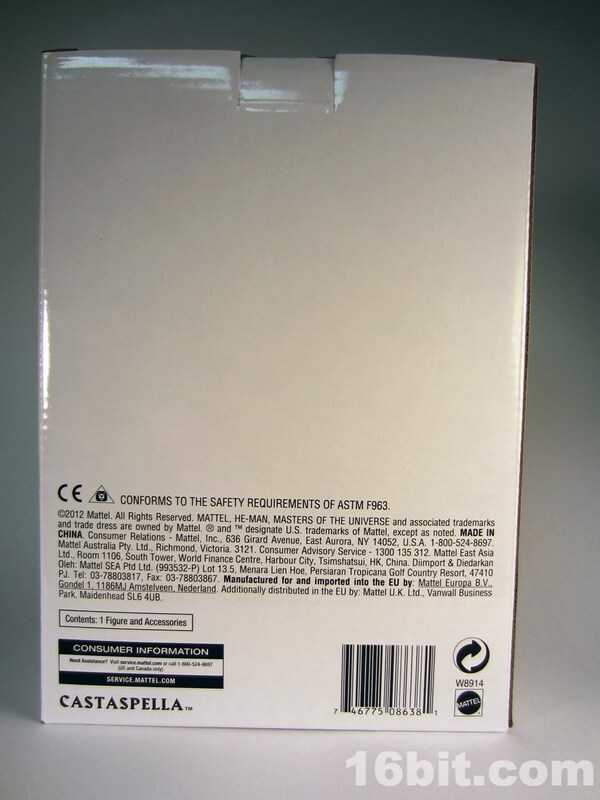 A pity, but in the days of cost-cutting it seems necessary. 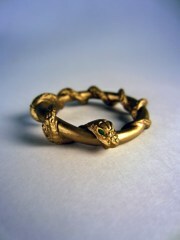 Aside from a redecorated club, he also includes the "snake ring" which caused his transformation in the storyline. It's painted gold and looks pretty nice, but as a toy collector it's mostly just a nice curiosity. 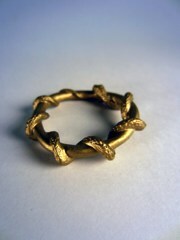 I don't wear the rings, I have nowhere to really display it, so into the parts bin it goes! 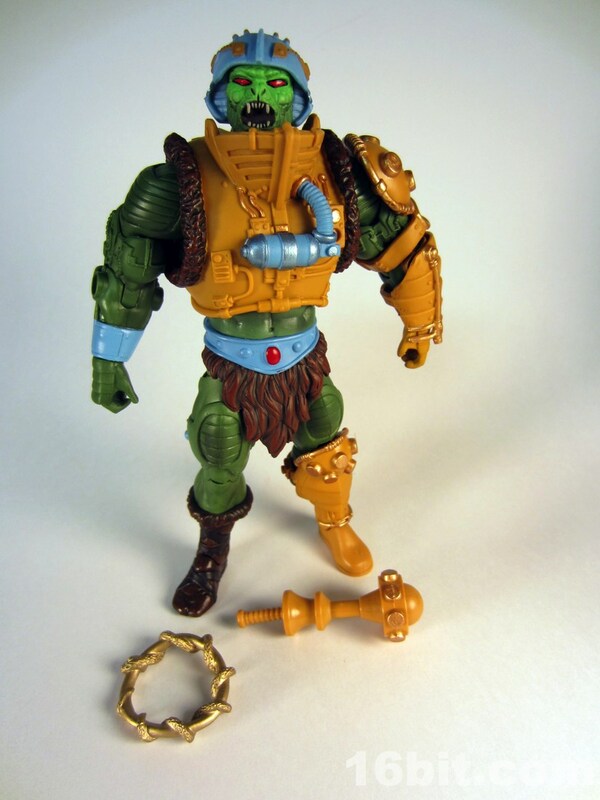 It's a shame, as this figure had very little new tooling in it and one of the two new pieces is something I really don't need. It's nice, it's well-executed, I just can't do anything useful with it. 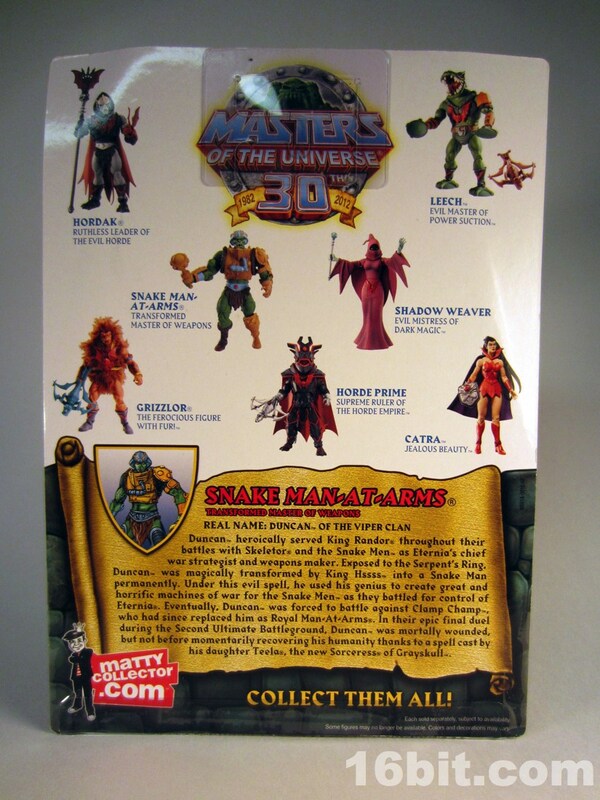 Aside from the minicomic, the primary reason to buy this toy is because you really want to collect them all and/or want a 2002-style Man-At-Arms. 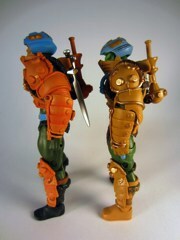 As you can see, the paint job looks really nice! 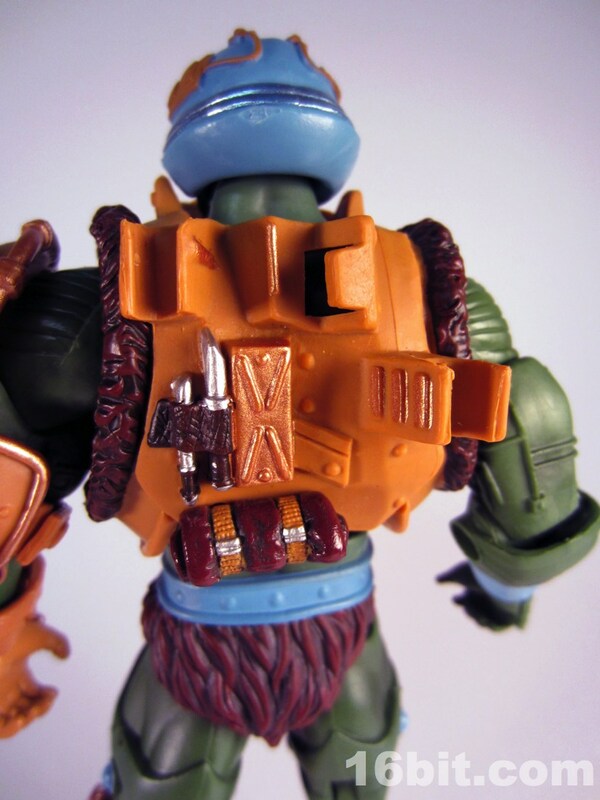 Metallic highlights were added to his armor which bring out some detail nicely, and other things (like painted rivets) were dropped. 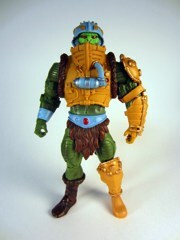 He sports the longer loincloth, and his left leg is the same basic one used on the Eternian Guards. 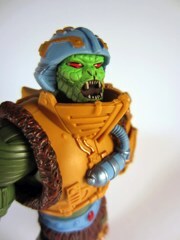 I should also note that not just his face, but his helmet has been retooled. 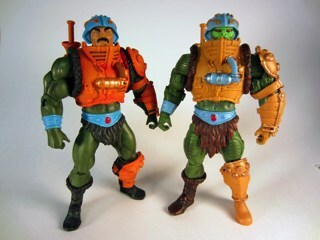 Some stripes and grooves were added to the snake version, and if you don't care for it the snake head is easily swapped with one of the previous Man-At-Arms noggins. 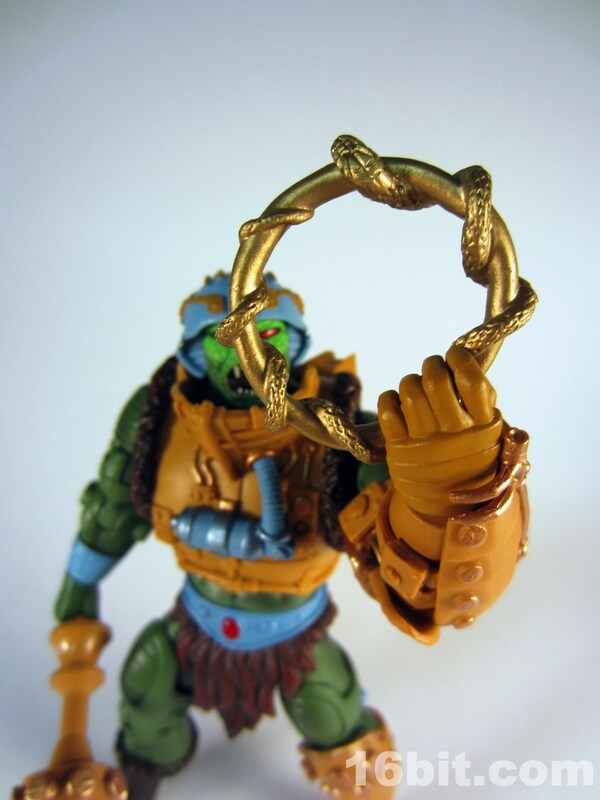 I feel this is a better Man-At-Arms than the original, although the snake head isn't exactly the one I would prefer to use. 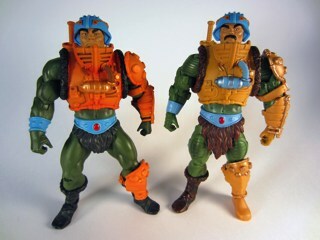 The paint job is much sharper and less sloppy, the longer loincloth looks great, and the color scheme is a real improvement. You can't go wrong with this one, unless you really, really hate the idea of Man-At-Arms being corruptible. The joints are nice and tight, but not to stiff. 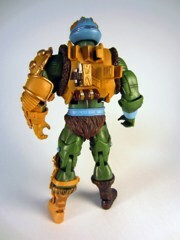 The accessories are limited, but well-executed. This is a worthwhile purchase, and if Mattel should ever decide to do a Filmation-derived version of Duncan I'd buy that too. Nicely done, gentlemen!